Finnish scientists have cracked open a cold one … a 170-year-old cold one, that is. 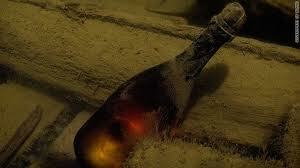 The bottle of beer, salvaged last summer from the wreckage of a ship that sank near the Aland Islands in the Baltic Sea, was thought to be the oldest drinkable beer ever found. Unfortunately, the Technical Research Center of Finland (VTT) reported June 27, the first bottle opened did not withstand the stresses of time. Seawater made it into the bottle, contaminating the brew. Nonetheless, the researchers were able to analyze the chemistry of the pale golden liquid. They found malt sugars, aromatic compounds and hops typical of what you’d expect to find in a bottle of beer today. The researchers had hoped to find live yeast cells in the brew, which would help them reverse-engineer the brewing process and replicate the beer. But no yeast cells survived the years 164 feet (50 meters) below the ocean’s surface. There were, however, live lactic acid bacteria in the bottle. These bacteria, sometimes used in brewing, would add a sour taste to the beverage.